Is your marketing function centralised, decentralised or distributed? This is the ninth in a series of one minute videos that address one of the many complex challenges facing marketing, media and advertising today. The Golden Minute series is an attempt to prove Albert Einstein right when he said “The definition of genius is taking the complex and making it simple”. But he also said “Everything should be made as simple as possible, but not simpler”. So we will leave it for you to judge. Please let us know here if there is a topic you would like us to cover in a Golden Minute. It is interesting that when you are talking to business people about marketing, the majority seem to think of marketing in the context of marketing communications, or what was not long ago considered Promotions or Advertising, one of the Ps in what was the 4Ps of marketing. This is probably not surprising as promotions and advertising are certainly the high profile and public end of the marketing process and certainly where a significant component of the budget is spent, especially on paid media, but increasingly on owned and earned media too. But the fact that many organisations think of marketing as the marketing communications area, leaves the question of where the other traditional marketing functions are located within the organisation? The reason is that often when we ask what marketing structure you have, the most common answers are either centralised or decentralised. 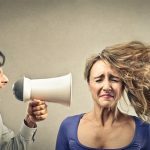 Only to find out that even when it is centralised, it is usually only the marketing communications function that is centralised and typically marketing is actually distributed across the organisation. With the marketing function fragmented and distributed across the business, it makes it challenging when we are asked to redesign marketing to drive a customer-oriented strategy across the organisation. On top of this distribution, we typically find fragmentation of key capabilities such as customer data, digital technology skills and the like, built into pockets across the business and rarely inside what is considered or called marketing. This, combined with the dislocation of the full marketing capability distribution, means that a cohesive and aligned marketing strategy is next to impossible without significant realignment in objectives, strategy, structure, roles, responsibilities and performance expectations. A more recent article in HBR titled “The Trouble with the CMO” studied the various job descriptions, roles and responsibilities for CMOs and identified three CMO job types that were related to the role and function marketing played within the organisation. The largest group at 46% of CMOs focus on commercialization. Basically, they have a downstream role and work primarily on using marketing communications to sell the products, services, and experiences that others design. This is the Marketing Comms, Promotions or sometimes called the Colouring Department. Typically, their responsibilities are overseeing traditional and digital media to create revenue-growing relationships with consumers. Next largest group at 31% of CMOs focus on strategy. They take the lead on developing the firm’s market positioning and then design new products, services, and customer experiences. Often they manage the customer insight and analytics functions and spearhead a company’s innovation efforts. 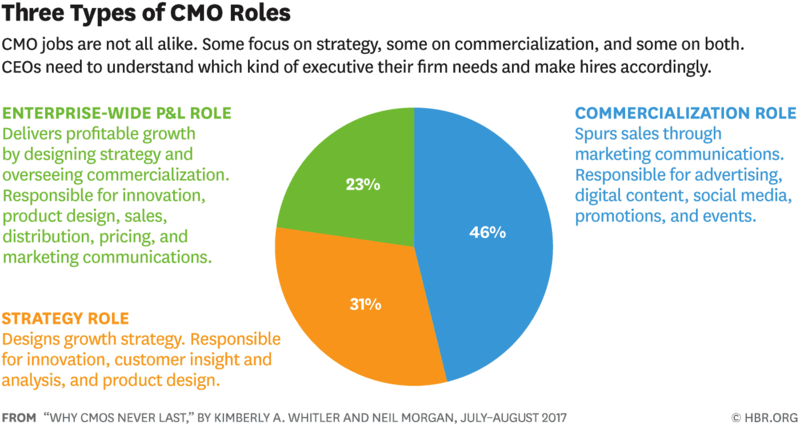 Finally at just 23% are CMOs who handle both strategy and commercialization responsibilities in an enterprise-wide role, focused on the design and implementation of the business and market strategy. Significantly, such CMOs have P&L responsibility and the broadest range of duties, including innovation, sales, distribution, and pricing. Interestingly if you accept the definition of the marketing function from the American Marketing Association being “Marketing is the activity, set of institutions, and processes for creating, communicating, delivering, and exchanging offerings that have value for customers, clients, partners, and society at large” then the only CMO role there that is truly responsible for the marketing function of those three is the third and smallest group. The other are more akin to Head of Marketing Strategy or Head of Advertising. But increasingly organisations are realising that they need to be more customer-centric, and that marketing is the strategy function and technology is the enabler to allow this to happen. So more and more marketing teams will be finding themselves realigned to the business customer, and less distributed across the business to be the communication function for products and services. How do you structure your marketing? Is it centralized or decentralized? The bigger the organization the more likely it’s decentralized. 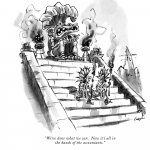 Or to achieve more consistent marketing is it centralized? But there are other marketing structures available. In fact today, marketing is more like to be distributed. Distributed across the organization into areas that don’t even realize they are marketing functions – like pricing, new product development, distribution, customer experience and – well you get the picture. No wonder some feel marketing is not delivering. 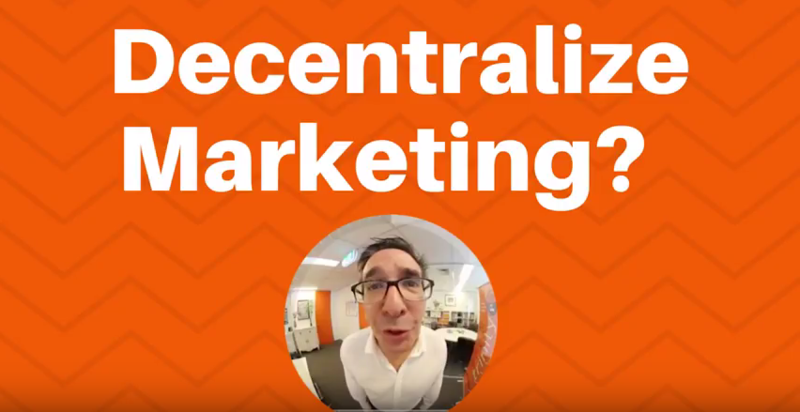 Not only is marketing often decentralized it is also fragmented, misaligned and fractured. How you structure your marketing depends on if you see it as a cost or an investment. A function of business or a growth engine. Structure follows strategy, but what is the right structure for your marketing strategy? Discover how we create marketing structures that are more integrated, agile and responsive to the business needs. What Happens When Ad Agency Creative Magic Fails?